has never told them not to do so. However, when they are extremely aggressive towards His Holiness the Dalai Lama, it naturally concerns the six million Tibetans. 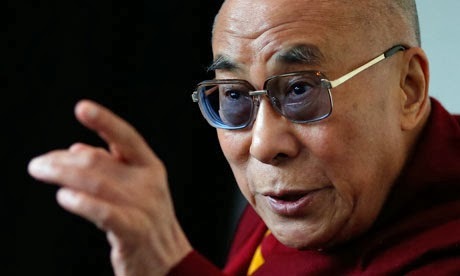 For example, a few days ago a white woman in Tibetan Buddhist robes verbally attacked the Dalai Lama, the 78 year-old leader of Tibetan people who had just arrived in San Francisco after tirelessly traveling from continent to continent, and city to city with no time to rest. Any other politician would have ignored her, perhaps offering her a fake smile. Not for the Dalai Lama, faking emotions is not in his blood. He spoke to her, trying to explain things in a way any Tibetan lama or monk who went to debating school habitually would, in, what he often calls, his broken English. Yet, the woman kept reciting her mantra, "you are lying," right to his face. While everyone has the right to protest against anyone, wearing Buddha's robe and verbally abusing the most reverent Buddhist lama in the world-the lama who is responsible of bringing the Tibetan Buddhism to the West-reminds one of the unthinkable actions of religious fundamentalists. In 1997, a highly respected 69-year-old Tibetan monk named Lobsang Gyamtso and two of his monk disciples were murdered in his house in Dharamsala, India, just a block away from the Dalai Lama's residence. The Indian police later reported that some worshipers of Shugden slaughtered the monks and then escaped to China. Following this, the Dalai Lama, who is a strong advocator of unity and peace in the human society, was concerned about the potential rise of sectarian conflict among Tibetan Buddhists. Do Western Shugden followers know what Tibetans know about this spirit? Many Tibetans understand the reasons why His Holiness is against Shugden worship. As a child, I grew up in the area where Kyabje Phawongka Rinpoche himself helped build a statue of Shugden in a Monastery. This monastery became one of the first places in Kham to be introduced to the Shugden spirit. I knew that people worshipped it out of fear, not out of love and respect. There was an old man in my village who first told me about it. He used to be a monk before Chinese came and had worshipped it. He would tell me that that spirit would "eat" person's soul if he or she practiced another religion. Although he had worshipped it, he talked about it as something about which people had to be very careful. It is common knowledge among Tibetans that if one worships Shugden, one is not allowed to practice other Tibetan Buddhist denominations, let alone other religions. This belief hinders the basic mission of His Holiness the Dalai Lama of working toward unity and respect between religions. Tibetans inside Tibet adopted His Holiness's philosophy of unity after he personally showed his sincerity in the belief of equality and unity of all Tibetan religious sects. Today the people of all three Cholkas (provinces) speak with one voice and engage in the same action. The school of Buddhists, such as Nyingmapa and Kagyupa, that had felt a sense of marginalization in the old Tibet because the central government was ruled by the Dalai Lamas who belonged to Gelugpa sect, are now actively engaging in fighting for the preservation of the Tibetan culture and political rights in all parts of Tibet. For Tibetans, this is the unity that we badly need and the Dalai Lama has created this unity by making room for all of our schools of the Tsampa eaters and Mani reciters to conduct their birth given duties. For Tibetan brothers and sisters who worship Shugden, worship it if you must, in my humble opinion. But here is something I want to ask you as someone who shares the same source of blood and bones as yours, as Snow Landers. Never lose the sense of your birth-given responsibility and never support the campaigns that try to sabotage the health of our only leader, His Holiness the 14th Dalai Lama. In this world, he is the only one who keeps our people's hope, and holds the sacred authority and the true wisdom of the Land of Snow. Both in the history and modern time, has there been anyone who has worked so hard and sacrificed so much for the future of our land and our children as the 14th Dalai Lama? Just as we don't hate our parents for having to make tough decisions for the goodness of all family members of ours, please do not let false words of others turn your hearts from the most basic moral position to shameful and regrettable directions. The Dalai Lama's health is the main bridge that we need to across the time of misfortune in which our people suffer. His good reputation is source of our dignity and benefits that we get as Tibetans everywhere we go. His smile and his words of wisdom dispel all the constant weapons of wrongful accusations fired towards our culture and our civilization. No matter what you do, our brotherhood and sisterhood can never be vanished because you and I were all born from Tibetans in or from the Land of Snow. I say again, that I don't hate you who continue to worship Shugden, but love you as brothers and sisters. My first wish for you is to listen to our sacred guide for this and future lives, for he has the deepest knowledge of what spiritual practice is all about and knows what is the best for our future, both politically and spiritually. If you choose not to do that, please at least don't support those who attack our sacred leader who is now in the 78 year-old human body. I hope you shared my pain when you saw the 14th Dalai Lama, our leader, being grossly and disrespectfully mistreated in public. This reminds us of our Panchen Lama being humiliated in public during the Cultural Revolution. We need to be aware of how religious fanaticism can blind the basic wisdom of human beings and make us do unthinkable things. But remember, my brothers and sisters, no matter how immature the lion cubs might be, they never attack their aged lion mother for whose deeds has kept the cubs alive. From a sincere brother of yours who deeply feels the love for you like any older brother would for his younger siblings. NOTE-- Gangbu Dorje is a Tibetan from Tibet, currently residing in San Francisco, U.S.A. and views expressed in the article are that of the writer, not necessarily an endorsement of the site. "Do Western Shugden followers know what Tibetans know about this spirit?" While Ganbu Dorje la is seemingly civil, let me be blunt. This author and his fatuous titles, I have read few of his holier than thou articles tsk tsking rangzen proponents, or else, he is against those who want to talk about genuine democracy in exile, or Middle Way. For this fundementalist Tibetan, there are no right and wrong, there is only the Dalai Lama and wrong. Well, I take umbrage with your attitude sir, as if you speak for all the Tibetan people everywhere. You don't speak for me, and what is more, you will never speak for those Tibetans who love democracy and free thought. Here he is, going on about some Western Shugden inji woman who is yelling at His Holiness, then he segues into the inevitable and banal admonition, "Never forget (or, let me remind you all), that as HH is the sun and the moon, that without him, we Tibetans would all be doomed, would all be just worthless pangos, so be good dogs and obey your master blindly. " FYI, there have been documented persecution of poor Tibetans in dharsa which was reported by Al-Jazeera, the name and shame campaign instigated by HH and SR, it is all there. And who indoctrinated Tibetan people to the efficacy of deity worship in the first place? Tibetans like this author and HH need to seriously take full responsibility for creating and maintaining such childish controversies like the Shugden, or the two Dalai Lama scenario coming up. So, you suggest not to reply to these Shugden protestors when we all know they are totally wrong? I understand that sometime our community go too far to shame these cult followers. Leave them alone and do not dare to mix middle way politics with this cult shugden issue to make this look more uglier and mess.Did you see how they have protested in CA? Thanks to this author G. Dorjee for replying and indeed his is the only piece out there! Thank you for your thoughts. 99.9% of Tibetans from out and in side of Tibet will support you and be grateful those whose voice can not be heard. An amazing relevant title! I am not amazed to see westerners protest against His Holiness but what hurts me more is our own people behind this ugly drama. Tibetan shugden followers need to understand and learn more about this cult and consequences of worshiping such cult. Our community shouldn't be so bias to these followers in general. It is not His Holiness but our own community who bring so much discrimination to these followers. Just leave them alone, let them pray whatever cult they wanted to worship. Decades ago, when I was a teanager, I still remember how RTWA and RTYC initiated signature campagne program through out Tibetan settlements in India - collected thousands of signatures from our community approving and swearing not to follow Shugden. This was done very harshly and in inhumane way! His Holiness name was used for such campagne. His Holiness have facts and reasons for not worshiping such cult and lets leave this simple and plain. Politicians out there, please do not make this more complicated in the name of His Holiness. I know as a Tibetan, it hurts to see these protestors' behavior but if we act to their tune we are fulfilling their wishes. Their wishes is nothing more than Chinese wishes!